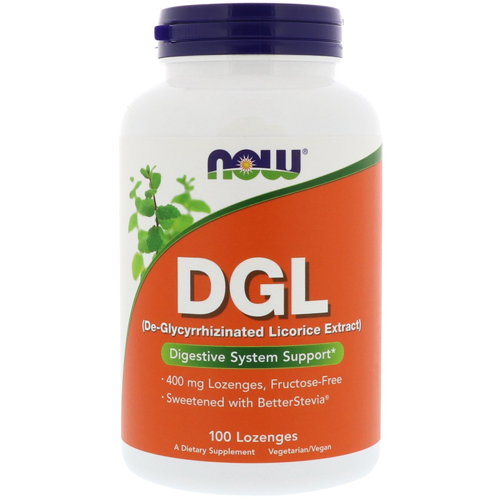 Now Foods De-Glycyrrhizinated Licorice (DGL) Extract delivers 400mg of licorice per chewable lozenge. Licorice has a long history as a traditoinal remedy for certain ailments and is now one of the best known medicinal herbs in use today. 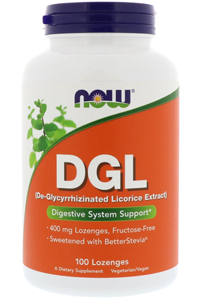 De-Glycyrrhizinated Licorice is a milder form of Licorice that is more appropriate for a chewable lozenge. As a dietary supplement, chew 1 to 2 lozenges daily. Chew slowly between or 20 minutes before a meal, or as advised by your healthcare practitioner. Fructose, xylitol, cellulose, stearic acid (vegetable source), maltodextrin, silica and natural flavours.